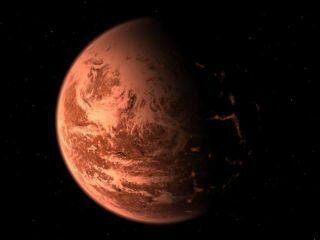 Artist's conception of the newly discovered planet around Gliese 876 -- it is shown as a hot, rocky, geologically active world glowing in the deep red light of its nearby parent star. SETI scientists are taking notice of the latest discovery of a "Super-Earth" beyond the solar system as they fine-tune their list of stars to target in their search for extraterrestrial intelligence. With the recent announcement of a planet seven to eight times the Earth's mass circling an M dwarf star, the chances for habitable worlds seem greater than ever. "It may well be that there are far more habitable planets orbiting M dwarfs than orbiting all other types of stars combined," explained Frank Drake, the Director of the SETI Institute's Center for the Study of Life in the Universe. "This is really exciting news for those interested in life beyond Earth," said Seth Shostak, Senior Astronomer at the SETI Institute, commenting on the discovery of a planet around Gleise 876, a small, red M star located just 15 light years from Earth. "To begin with, it's at least a tentative indication that small planets -- those more or less the same heft as our own world -- might be commonplace. Secondly, it's proof that dim, little M dwarf stars, which are roughly eight times as plentiful as stars like the Sun, can also host rocky planets." The parent star, Gleise 876, is no stranger to planet hunters, who discovered two Jupiter-sized planets orbiting it in 1998 and 2001. This grouping of planets--two large and one small--reminds Carnegie Institution astrophysicist Alan Boss of families of planets discovered less than a year ago around the stars mu Arae and 55 Cancri. "All three of these stars have a hot, seven-to-fifteen Earth-mass planet as well as two or more Jupiter-mass planets orbiting at considerably greater distances," explained Boss. "The neat thing is that mu Arae and 55 Cancri are solar-type stars," in contrast to Gleise 876, the M dwarf. "Now we have some good evidence for M dwarfs having planetary systems vaguely similar to our own, though on a smaller scale." M stars have historically been considered unsuitable for SETI observations. The "Goldilocks" analogy suggested that planets whose temperature was "just right" for life would orbit so close to their star that they would be tidally locked. As a result, the world would quickly become "too hot" on one side, and "too cold" on the other: the atmosphere would boil off on the light side, and freeze out on the dark side. These stars also flare, producing X and UV radiation that will challenge any life on the surface. The planet recently discovered around Gleise 876 is unlikely to bear life because its orbit is so close to the star, giving the planet an extremely high surface temperature. "Simple theory said that terrestrial planets in orbit around M stars will be uninhabitable, and uninhabited," explained Jill Tarter, Director of the Center for SETI Research at the SETI Institute. "But we are not confined to simple theory any more. Recent models predict sustainable atmospheres and substellar liquid water regimes," she said. "A growing appreciation for natural sun screens that developed early in the evolution of life on Earth, and a speculation that niche sterilizing events might actually speed evolution towards complex life, make M stars worth considering once again. And reconsider them we will!" To tackle to complexity of the issues, Tarter and her colleagues at the SETI Institute will host the first of a series of workshops on the habitability of M stars from July 18-20, 2005. Nearly 40 participants from academia and NASA Astrobiology Institute (NAI) lead teams--including members of the SETI Institute's own NAI lead team--will gather to decide whether M stars should be on the list of target stars for SETI observations. According to Boss, who will also participate in the workshops, the timing of the recent discovery of a small planet around Gleise 876 is auspicious. "M dwarfs are the most common type of star in our galaxy so that is good news for looking for Earths, and in particular for the July workshop at the SETI Institute." Tarter agreed: "Most of the stars out there are M stars," she said. "They haven't been on our target list. Maybe they should be. And if that's the case, the list just got a whole lot bigger."